Our traditional floor-mounted positioner is a heavy-duty, 5G capable antenna measurement system which is comparatively low cost. The D6050 is capable of continuous rotation about azimuth and elevation axes with equipped slip ring and appropriate rotary joints. It excels at isolating your AUT and, when coupled with the included DAMS Measurement Suite, enables you to accurately measure gain, RCS, phase center, calculate path-loss and more. The system can be equipped with 6, 18, 40, and 67 GHz options, as well as millimeter wave hardware, enabling you to test a wide range of frequencies. The D6050 is compatible with a wide range of VNAs, real time spectrum analyzers and nearly every common piece of RF measurement equipment, making it very well-suited for general lab use. The D6050 an all-inclusive solution for all of your antenna measurement needs. Now offering our full feature two-port simulator with wave analysis which includes fully customizable drag-and-drop elements that enable users to create diversified simulations in frequency or time domain. 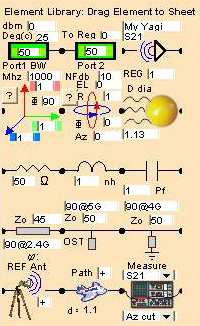 Three main objects include schematic, amplitude (or Smith chart) and an array calculator.